Photos by Joe Kashi, for the Redoubt Reporter. A cow moose nurses her twin newborn calves in a field along Robinson Loop Road in Sterling on Tuesday. 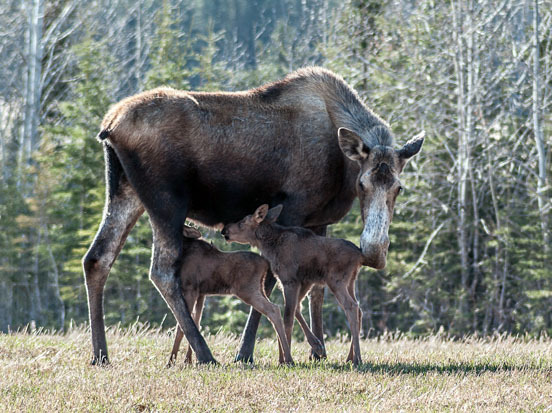 Moose calves tend to be born in about a four-week period from mid-May to early June. They can stand soon after being born, and begin to nurse almost immediately. Mother’s milk is their main sustenance for about the first month of life. 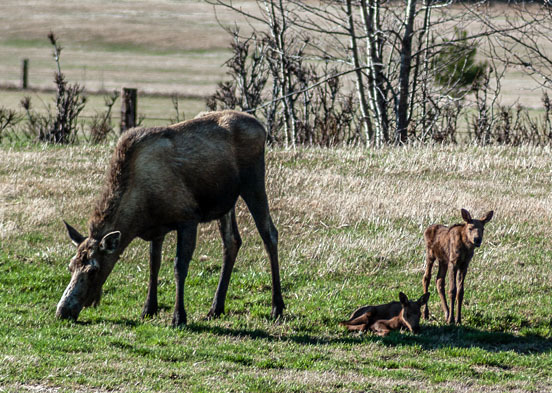 Along with the return of salmon to area rivers and the parade of motor homes down the Sterling Highway, the appearance of newborn moose calves is the third sure harbinger of the arrival of the summer season on the Kenai Peninsula. Calves started showing up last week, as they tend to do in a four-week period around mid-May to early June, though some give birth later if they bred later. An average moose calf weighs about 40 pounds when born, and twins typically weigh a few pounds less than single cows. Calves can stand and take tottering steps on their wobbly legs a few hours after birth. But unlike caribou calves, which must be able to move soon after birth to keep up with their roaming herd, moose cows and calves tend to stay fairly stationary after calving, which is easier for cows to protect their young. Calves begin nursing soon, almost immediately, after birth. They can start eating vegetation within a few days, but mom’s milk remains their main source of sustenance for about their first month. Moose calves have a tough go of it, as they are a prime source of prey for bears, wolves and other predators. And humans can be a cause of stress, and even death, this time of year. There are a few things people can do to make help make sure they aren’t an inadvertent contributing cause of calf mortality. Keep your distance. Few things rank higher on the cute meter than newborn animals, and moose calves are a particularly endearing sight — with ears, eyes and legs out of proportion to their downy bodies. But view them from a respectable distance. Getting too close could cause calves and cows stress, or could even cause them to flee — potentially across a road or away from the relative safety of the calving spot the cow has chosen. Also, if cows and calves are already moving, don’t block their path, with yourself or your vehicle. Don’t assume a calf is lost or orphaned just because you see it alone. The cow might be unseen nearby, and could reunite with its calf even after a seemingly long absence of a day or more. Interfering with a calf might only interfere with its mother rejoining it. Even if a calf is alone, the harsh reality of nature is that calves have their place in the wild food chain. Calf survivability is important for the health of the moose population, but reality is that the majority will not survive the summer. Be safe driving. That’s a good rule any time of year, and it remains true in calving season. Always drive with lights on and be extra vigilant at twilight and in the evening. Watch not only the road but the sides of the road, as moose can be difficult to spot when standing camouflaged against vegetation, and can choose to cross a road with no apparent reason or warning. Restrain your pets. Newborn moose calves aren’t able to defend themselves and are particularly susceptible to injury and death from other animals. Moose cows are particularly protective of their new young and will be more aggressive than usual this time of year, meaning even a merely curious dog could get stomped if it gets too close. Reduce attractants. 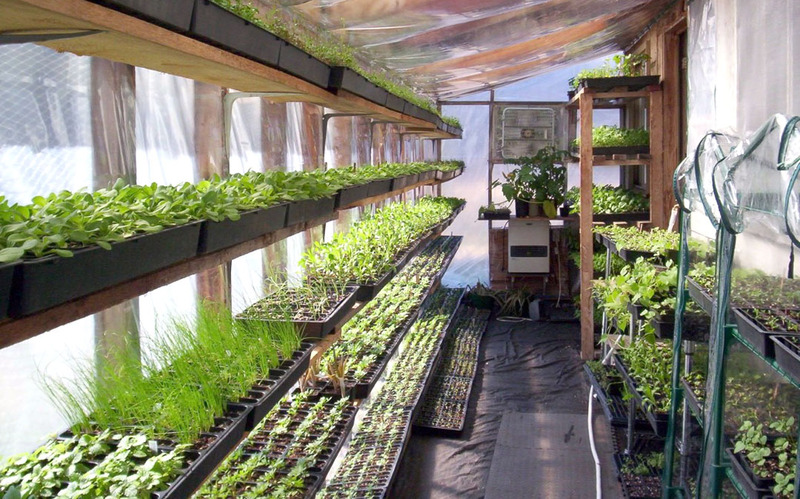 Moose are meant to eat natural browse — the young trees that are sprouting as we speak. But they sample garbage, pet food, garden growth and other items inadvertently provided by humanity. Don’t let them. Non-natural foods can be difficult for moose to digest, causing sickness and even death. All the rules for reducing bear attractants around a home hold true for moose, as well. Editor’s note: This is part one of a two-part story regarding Tom Anderson and the sixth-grade musicals he directed at Soldotna Elementary School. This week focuses on the 18 years of the much-beloved musicals at the school. Next edition, June 12, will be about Anderson and his lasting impact on his students and community. Photos courtesy of Bud Draper. 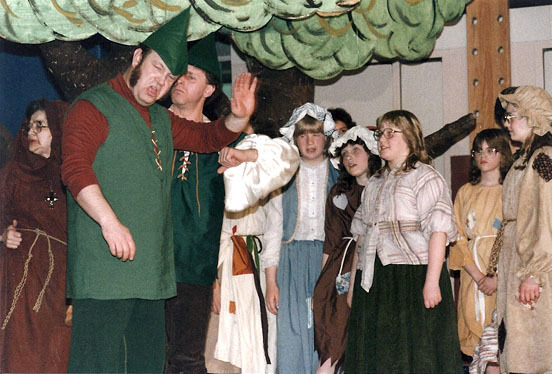 Tom Anderson performs with Soldotna Elementary School sixth-graders in a production of “Robin Hood” in the 1980s. The school had an 18-year tradition of elaborate musicals, in no small part due to the efforts of Anderson. Sixth grade — a blur of emotions, energy, hormones, budding independence, self-consciousness and growth spurts. Brains won’t be fully formed for another 10-plus years. It’s a challenge for clear, detailed, long-lasting memories to form in that developmental soup. Usually what’s retained is a miasma of vague impressions and a few hazy recollections tinged with the awkwardness and uncertainty of early adolescence. Not the case for the sixth-grade students of Soldotna Elementary from 1980 to 1998. For many of them, sixth grade was a landmark of their early schooling, a source of excitement, confidence, fun and achievement. Of long rehearsals working side by side with adults and fellow students, to create an elaborate musical production as a team that would be seen and raved about by the whole school, and other schools, and the community beyond that. To this day — decades after the last sets were struck and the riotous applause died down — those musicals are still cemented into the memory banks. Lineman arrived at SoEl in 1977. 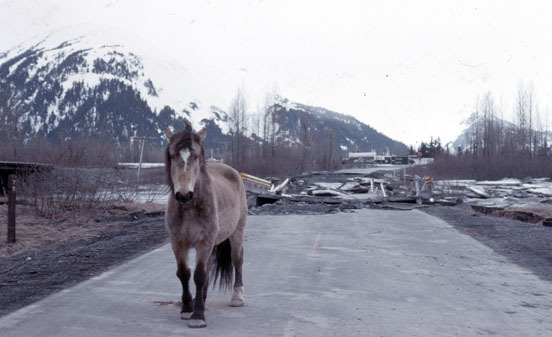 At that time the school was the biggest in the Kenai Peninsula Borough School District, with a village of portable classrooms orbiting the main building to contain the bursting-at-the seams enrollment into some sort of gravitational cohesion. Anything involving the entire student body was a logistical challenge befitting the exuberance — and, perhaps, lack of experience to know better — of a new teacher. “My first Christmas program I had everybody in the school do it, every grade. And the fire marshal came and wanted to close us down because there were 500 kids in the gym and then there were all these parents wanting to come in too. 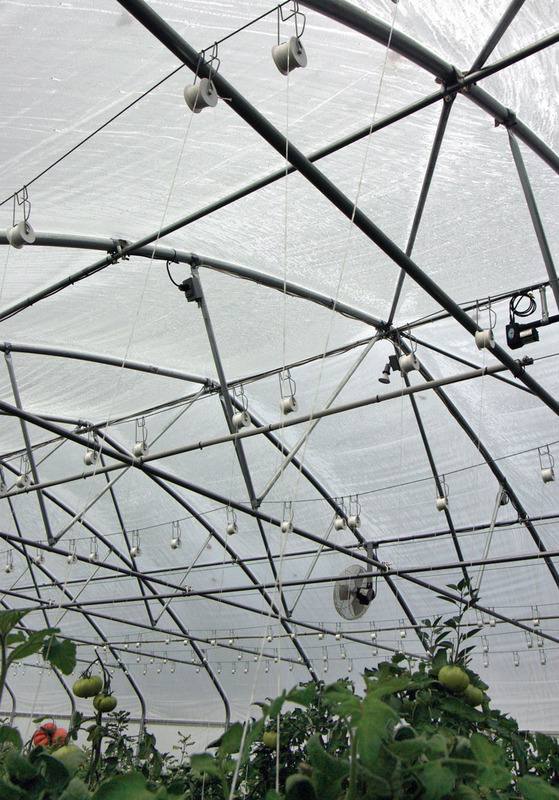 I had no idea what I was doing,” Lindman said. The next year, he split up his music productions into a Christmas show for the younger kids and a spring program for the fourth- through sixth-graders. But that didn’t quite work, either. He found receptive sounding boards and fellow out-of-the-box thinkers in some of his fellow teachers, particularly Tom Anderson. 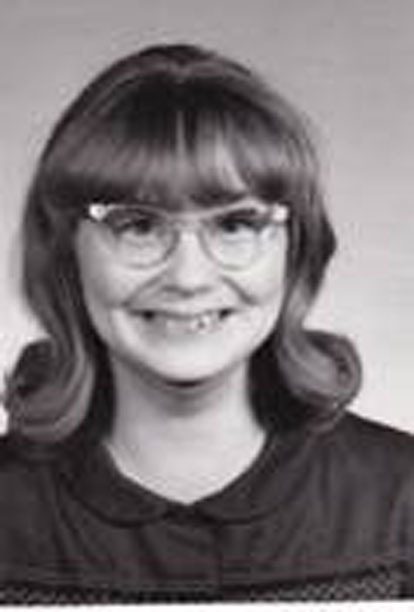 Anderson arrived in 1976 to teach third grade, also his first teaching assignment. Anderson loved theater as much as teaching, and was already finding ways to combine the two. Throughout his tenure as a classroom teacher he’d stage 1950s and ’60s-themed lip-syncing shows with his students, and would collaborate on an Alaska Museum unit, complete with building massive igloos and Dena’ina longhouses in the hallway as entrances to the classrooms. In 1980, Lindman and Anderson decided to stage a musical, “Jungle Book,” with just the sixth-graders as the students’ end-of-the-year production. Given their flair for the dramatic and free rein for creativity it was, indeed, quite the production. “We didn’t ever do anything minimally, I guess, so if we were going to do something, we were going to really do it. It instantly turned into decorating the whole gym as a jungle. And it was a big hit, but we only did one performance and only like 300 people saw it. As we were ripping it down, everybody was going, ‘Shouldn’t we do this again?’” Lindman said. Photos by Joseph Robertia, Redoubt Reporter. 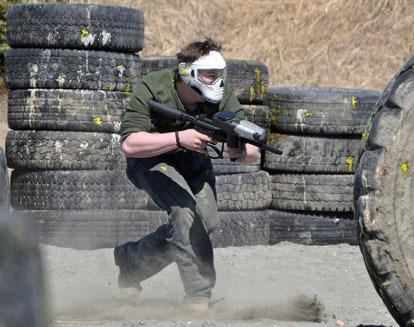 A skull-masked player advances down the field while taking heavy fire at the Pointblank paintball course May 25. The new course is located off Kalifornsky Beach Road. 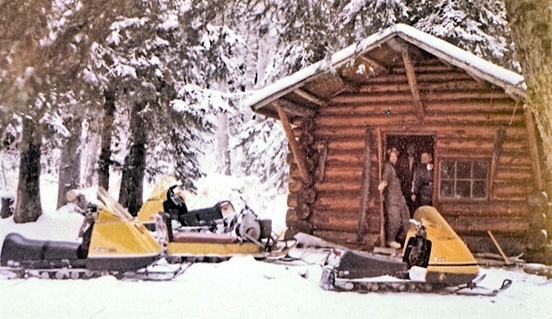 On the central Kenai Peninsula, the term “combat” is often used to describe the hordes of fishermen that line the banks of various streams when salmon are running. But May 25, combat took a more literal meaning in a field of grass, sand and obstacles off of Kalifornsky Beach Road. Other than the preponderance of camo gear, the group of guys gathered Saturday morning didn’t seem out of the ordinary, being students, employees, employers, sons and fathers. But as operations began, they donned another mantle — that of soldier, armed with their weapon of choice, the paintball gun. Behind him, the rest of his team and the opposing crew were outfitted in SWAT-like protective gear and masks — at least one bearing a resemblance to a skull to strike fear into his enemies — and all carrying various forms of paint-propelling firearms, including a few designed to look like AK-47s or AR-15s. One of the owners of the new course, got in on a few matches. He said this is one of the best aspect of paintball — that people of all ages, sizes and experience levels can play at the same time. When the official sounded the start of the match through a bullhorn, controlled chaos ensued. A hailstorm of hundreds of small, blue rounds flew in all directions as some of the guns — technically called “markers” — had the ability to shoot as many as 16 balls per second at a speed of nearly 300 feet per second. The growling shouts of teams directing their assaults were punctuated by the frequent “pop-pop-pop-pop” of rounds being fired. There were intense, close-quarters maneuvers throughout the field, peppered with stacks of tires and large wooden spools providing scant cover. An assailant would turn a corner to find himself face to face with an adversary he had to shoot before getting shot first. Shooters often found themselves close enough to see the whites, and surprise, in the eyes of their opponents. “I’ll probably go through 4,000 rounds today,” said John Revis, 25, of Sterling, who was playing with several of his AK Ragnarok teammates. 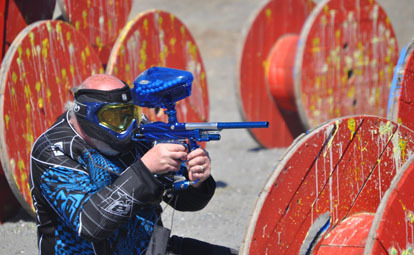 Having gotten into paintball roughly 11 years ago, Revis has evolved into an upper-echelon player of the sport, competing in numerous tournaments around the state and in the Lower 48, some with as many as 7,000 players. “I go to the gym, run and exercise year-round to stay in shape for this,” he said. Photos by Joseph Robertia, Redoubt Reporter. Steve Buben, a professional 3-D animator, demonstrates his art skills to third-grade students at Soldotna Elementary School on May 20, in an effort to teach them some of the basics of drawing. Buben currently works in Salt Lake City but was raised on the central Kenai Peninsula. Art in elementary school is about more than bringing home things for mom or dad to hang on the refrigerator. Art develops creativity, teaches divergent ways of thinking and using the brain, builds motor skills and, for some students, sows the seeds for what eventually could become a career. The latter is exactly what happened for Steven Buben, 27, a recent graduate of the Art Institute of Salt Lake City. His love of art began when he was just a kid attending Sterling Elementary School, and he continued to feed his interest during his time at Soldotna Middle and Skyview High schools. 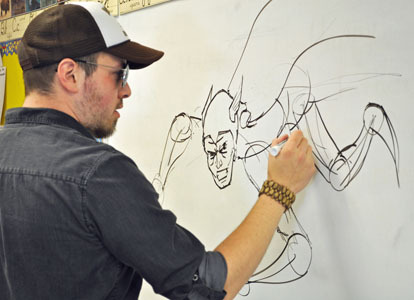 He now is employed in Utah as a professional animator and 3-D generalist, making special effects for Hollywood movies, including the upcoming film “Zombie Hunters,” as well as music videos and video games. ”I grew up drawing, and people would tell me my drawings looked amazing, so I just kept going with it,” he said. Buben has not forgotten his roots. Despite living in the Lower 48, he has spent the last two years with students in the third-grade classroom of his mother, Gayle Buben, at Soldotna Elementary via live video chats. During these sessions he’s been teaching the kids some of the fundamentals of drawing, particularly things he remembers finding interesting at their age. “Art was still part of the curriculum when I was in school, but it was a lot of glitter and macaroni art. Which, no offense to those things, but I was way more interested in drawing things like Sonic the Hedgehog and Raphael from the ‘Teenage Mutant Ninja Turtles,’” he said. Photos courtesy of the Kenai Watershed Forum. The Wailin’ Jennys will perform 8 p.m. June 8 at the Kenai Watershed Forum’s Kenai River Festival June 7, 8 and 9 at Soldotna Creek Park. 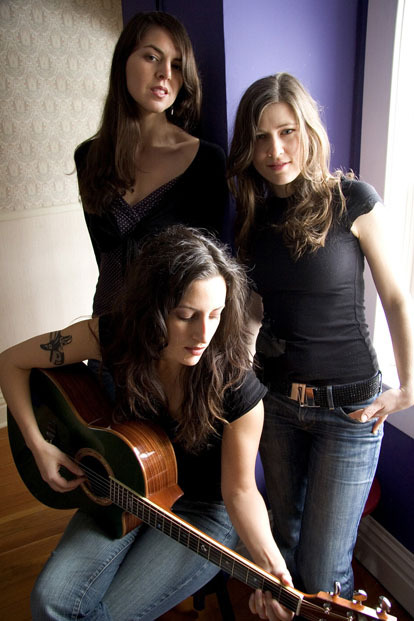 As far as rumors go, this has been a potent one — that the Wailin’ Jennys are headlining the 23rd annual Kenai River Festival. What could be more of a surprise? That the Run for the River is being replaced with a monster truck rally? That the Kid Zone wooden fish painting is discontinued in favor of an activity to see what pretty sheens kids can create by dumping gasoline into Soldotna Creek? That instead of the fresh salmon dinner, the Kenai Watershed Forum will instead be serving up microwaved hot dogs and deep-fried Twinkies? All sound unbelievable, but luckily only the first is true — the Wailin’ Jennys are indeed performing a free concert during the festival. “I’m really excited about it, it’s going to be dynamite. 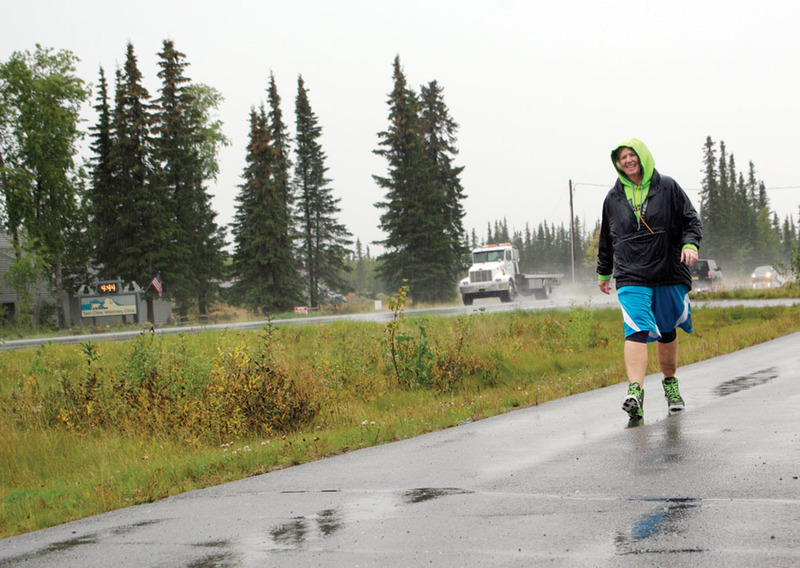 I think it’s very suiting for the Kenai River Festival,” said Robb Justice, music coordinator. The Wailin’ Jennys — the name being a takeoff on Waylon Jennings — is a Canadian music group founded in 2002 in Winnipeg. They have released four albums, with 2006’s “Firecraker” peaking at No. 2 on the Billboard Bluegrass charts. They’ve performed on a “A Prairie Home Companion,” and have won two Juno Awards, the Canadian equivalent to a Grammy. They performed on the Kenai in 2005 and 2008, and their angelic harmonies, intricate arrangements and vibrant sound resulted in scores of devoted fans who have been thrilled to hear about the river festival performance. Music has been a staple of the three-day festival, this year to be held June 7, 8 and 9 at Soldotna Creek Park. It’s always a mix of local musicians and out-of-town bands, generally with singer-songwriters playing during the day, and bigger bands jamming away the evenings. For music lovers, it’s a great chance to sample the current music scene all in one setting, while lounging in the grass, participating in the many family activities, perusing the educational displays, browsing the wares of the arts and crafts vendors, sampling the many food options available or, for adults, having a libation in the beer garden. Instead of listeners going to umpteen different venues to catch the 23 acts, the festival brings the musicians all to one spot, with no cover charge. Good journalistic practice requires a crisp lead paragraph concisely setting out an article’s theme. So, bowing to tradition and The Associated Press Stylebook, this week’s theme is “Disorganized catchall — photo gear edition.” On with the show! Nikon’s recently introduced P330 is a pocketable and capable premium compact camera that punches well above its weight class. With a $380 list price, it’s among the least-expensive, premium-compact cameras and includes a medium-size, 1/1.7-inch sensor, optional RAW image formats, and a sharp, f/1.8 to f/5.6 zoom lens that reaches between 24-mm (equivalent) wide angles and 120-mm (equivalent) moderate telephoto magnifications. The P330’s sensor has the best DXO sensor rating of any comparable premium compact on the market. Image quality is quite good up to ISO 800 and the zoom lens’ image-stabilization and fast f/1.8 maximum aperture at wide-angle settings helps a lot in dim light. This would be my choice as a first serious camera for a departing college student. Photos by Jenny Neyman, Redoubt Reporter. Cowboys and cowgirls on horseback drive cattle down College Road on Sunday, during their trek from Diamond M Ranch to the Soldotna Rodeo Grounds. Some amount of unusual is to be expected these days along Kalifornsky Beach Road between Kenai and Soldotna — the orange signs, cones and flagging of the ongoing road resurfacing project, the bright yellow trash bags awaiting pickup from the annual spring cleanup week, and the sudden proliferation of walkers, runners and bike riders along the paved pedestrian Unity Trail, now that it’s finally free of snow and mud. As in mooing, grazing, milk-producing, beef-steak-generating bovines flanked by cowboys and cowgirls mounted on horseback, being herded along the road like a scene from “Bonanza,” only with motor vehicles, rather than tumbleweeds, passing by. 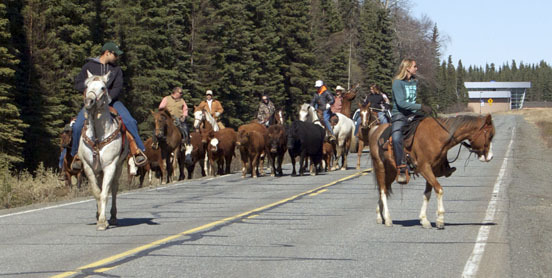 Even this unusual scene is becoming a traditional one for those who happen to be on K-Beach during the annual Soldotna Equestrian Association cattle drive, held since 2011 to kick off the rodeo season. 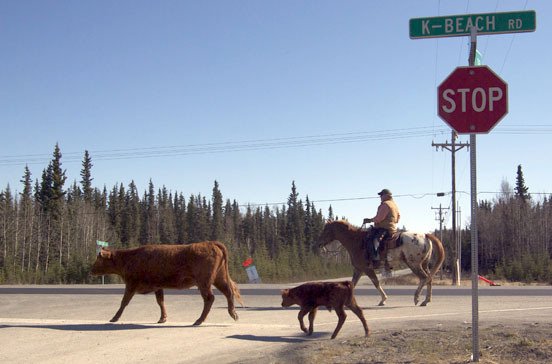 Mike Ashwell accompanies a cow and her weeks-old calf across an intersection along Kalifornsky Beach Road on Saturday during the Soldotna Equestrian Association’s annual cattle drive held to kick off rodeo season. “It’s kind of fun because there’s lots of people that stop and take pictures and honk, and there’s a lot of people that are interested in watching it along K-Beach because it’s not something you see every day. In fact, you only see it once a year. It’s a fun event for the riders, and I hope it’s a fun event for the community that gets to see it. And it hopefully raises some awareness for what SEA is and does, and for our rodeo,” said Mike Ashwell, vice president of SEA. There are five rodeo events held on the Kenai Peninsula during the spring and summer, three at the Soldotna Rodeo Grounds behind the ball fields by the Soldotna Sports Center, and two in Ninilchik, with the first rodeo set to begin at 2 p.m. this Saturday and Sunday in Soldotna. The kickoff has felt like it’s come sooner than usual this year, because winter has taken longer than usual to melt into spring. Despite the last-minute hurry to finish spring chores, SEA is set to swing into its usual busy schedule — with bucking on Mondays, roping on Tuesdays, barrel racing and pole bending on Wednesdays, team penning on Thursdays, and jackpot events on Fridays before the weekend rodeos, as well as other organizations holding events, including a pony club and dog herding practice. Information and schedules can be found at www.soldotnaequestrianassociation.com.